Political: Fulfilling election promises to solve problems such as congestion. Financial Stewardship: Increasing public purse revenue to fund other projects such as transit. Quality of Service: Improving the lifestyle of constituents and improving the economic development of city businesses. Public Trust: Reducing emissions, demonstrating that the city is well-managed and improving the city’s image in the hope of being reelected. Although increasing revenue is a priority, reducing costs is closely related. Overall contribution to the bottom line is the real measure that we want to achieve. Another key factor to increasing contribution is ensuring that all parking lots are full. It is not uncommon for some parking lots to be completely packed while other parking lots close by are unoccupied. As a result, parking spots are consistently vacant which is a poor return on assets. Big Data or Business Intelligence tools can provide insights and visibility to these underutilized assets which will increase contribution for both public sector and private sector enterprises. The effort required to determine this type of incremental rate improvement process is significant. 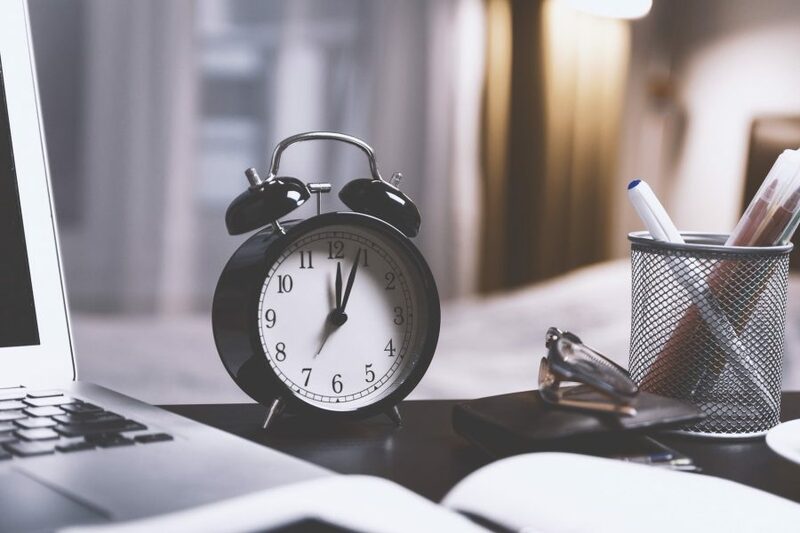 The logical next step in this type of analysis is to move to machine learning and predictive modeling, allowing for faster analysis and near real-time adjustments of rates. Drivers are mobile. So, a mobile guidance solution is mandatory to guide drivers to available parking. In March 2017, Cardiff Council implemented a smart parking solution. They implemented 3,000 in-ground SmartSensors as well as a network of SmartSpot gateways to relay communications into the SmartCloud platform. SmartCloud processed this data and fed live information to variable messagesignage that was strategically placed around the city as well as into the bilingual (English and Welsh) Park Cardiff app that they developed. Using the Park Cardiff app, a citizen can now check for parking conditions before they leave home and have the ability to receive real-time guidance to their parking spots once they were in the city. Council officers can now view live parking events and generate reports and analytics that allow insights into parking behavior. This makes it much easier for enforcement to tag offenders and increase their ticketing revenue. 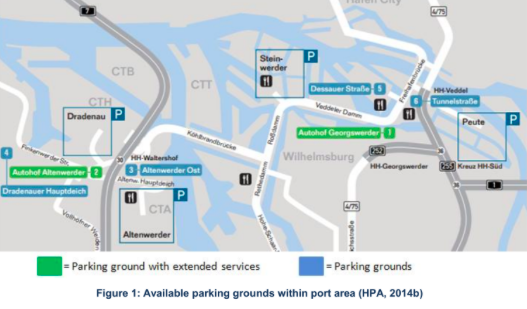 There are six parking grounds with truck parking slots within or close to the port area of Hamburg. It is critical for the port operation that trucks can be moved through port efficiently. To eliminate the bottlenecks that can happen due to parking trucks, the port of Hamburg implemented a Smart Parking application to optimize the six parking lots to ensure efficient movement of cargo and trucks. Beyond the need for the grounds to ensure the quick movement of cargo, their drivers also required additional services when parking. Table 1 illustrates the maximum parking occupancy and services available within the lots. Although it is out of the port area, another parking lot called “Autohof Moorfleet” is included in these figures. Called pre-gate parking, this lot is designed to control access to the port. When necessary, trucks are scheduled into this parking lot to wait for a parking spot inside the harbor. Trucks have specific times that they are expected to pick up their cargo, most of which is in containers. To appreciate the magnitude of this endeavor, it is worth noting the port of Hamburg was called on by 9700 ocean-going vessels in 2013, each carrying a large scale of containerized cargo. Parking ground data acquisition: Induction loops were installed within the asphalt. Efficient use of parking space: Dynamic electronic signs lead trucks to their designated parking spots in the pre-gate parking. Information processing and provision of data: The third pillar is the consolidation of information and the provision of data to end users such as truck drivers and route planners. Using the Internet, truck drivers and route planners can receive live information about the parking space situation and react immediately. As the numbers of automobiles in use increases, it has become critical to design parking lots for maximum utilization. Using Big Data analysis techniques, it is possible to develop predictive models of the future demands on parking spots. With additional Big Data analytics such as linear programming, it is possible to determine the most efficient layout design. Conventional parking lot layouts that employ a 90° layout format have proven to be incredibly frustrating for drivers. They often lead to accidents and traffic congestion. Angular parking has proven to be a more efficient mechanism to facilitate easy entrance, exit and traffic movement. 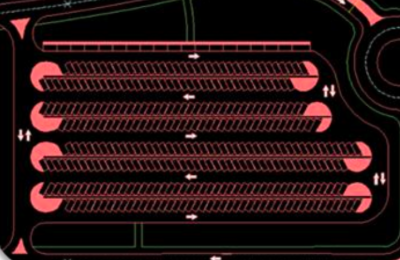 Parking lots at Walmart and Disney World are using angular parking layouts with one way driving patterns. In addition to layout design, there are now many additional requirements that must be considered in all new parking lot designs. These additional concerns all require big data analytics to be utilized to ensure that future parking lots and services are optimized to serve a community. This reality opens a remarkable new stream of revenue for parking lot owners. Electric cars need to be recharged. Parking operators will be able to collect a surcharge for the ease of charging electric cars in their parking lots. This is a new revenue stream. In 2018, a North American family owns 2.1 cars. By 2030, it will drop to 1.2 cars due to driverless cars. This will cause at least a 43% drop in demand for parking spaces. Although this will reduce parking lot revenue, parking lots can be designed very differently as a result of this change. A driverless car parking lot does not have to concern itself with people or opening doors. Four driverless cars can fit into three conventional parking spots. Likely, driverless cars will be able to maneuver in smaller places, allowing a parking operator to further increase the number of cars in their lot. All these changes will enable an operator to increase their revenue and optimize their parking assets. Parking optimization and increasing revenue are very tightly linked. Parking operators who utilize predictive analytics will be better prepared for the pressures soon to face the parking industry. Parking spot demand is expected to reduce or level off with the introduction of driverless cars over the next ten years. 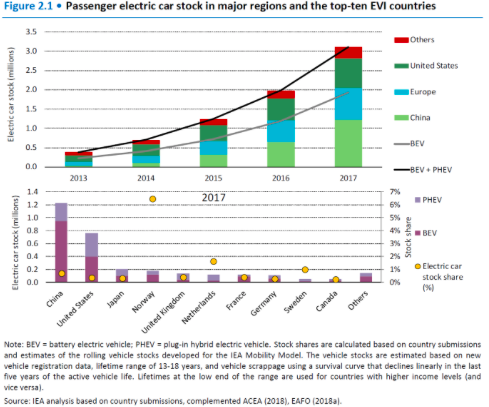 The significant expansion in electric vehicles will further demand new services from parking lot owners and a new revenue stream. Big data and business intelligence technology will be a key tool for operators as they transition to the parking operating model.